Online subscriptions are complex but we try to make managing your MAF Supplement subscription as easy as possible. What areas of my subscription can I manage? 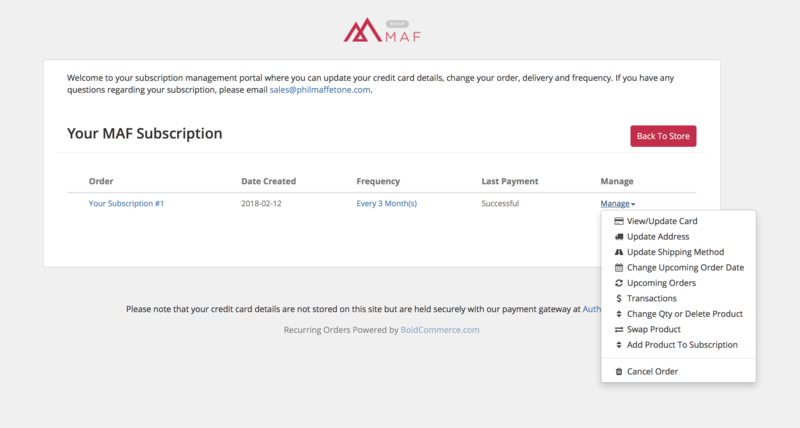 To manage your subscription, you must have a MAF Shop account set up and you will have received an activation email regarding this. Once you have activated your account, you are all set to go and can login at any time. I don't have a MAF Shop account? If for any reason you can't find your activation email, you can create an account with the same email address that you used to order your Supplement Subscription. I'm logged into my account - where do I manage my subscription? If you have any questions, please don't hesitate to email us at sales@philmaffetone.com.